Because I Said So? 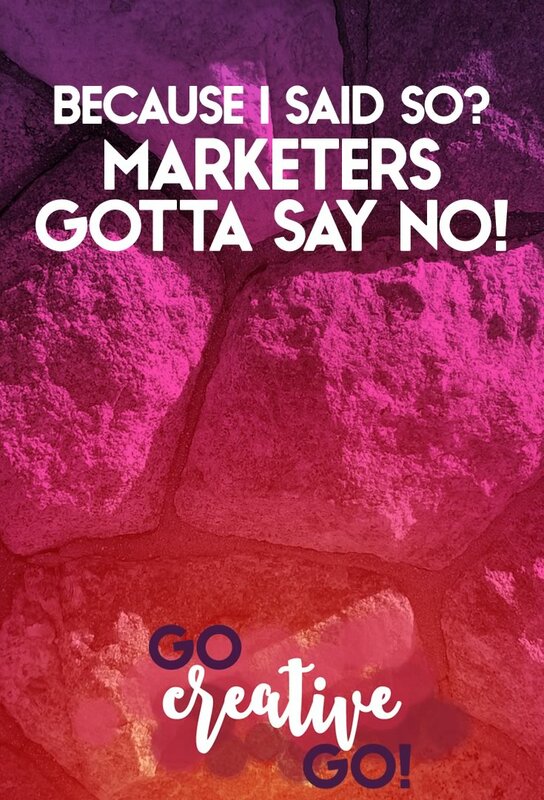 Better Marketers Just Say No! - Go Creative Go! Because I Said So syndrome is insidious. It’s incredibly contagious and something digital marketers, bloggers and other creatives face in blog posts and social media shares every day. Listen To Me! Did You Say Something? How does a social business fend off the syndrome? Above all else, I urge you to remember that social business, and social sharing, is about the conversation and the relationship. Conversations are two way, at the very least, depending on the number of parties involved. Listening should, then, take up 50% of your time as a participant in the conversation – and possibly quite a lot more. Delivering On Promises, Because You Said So! We’ve all heard it. Our moms said it, A LOT! If it sounds too good to be true…it probably is. HOOEY! If there’s one thing we know about the social business of relationship building, reputation management and content curation it’s that it’s absolutely NOT effortless. It might be fun. For some of us it might even be relatively simple. But it’s still work. It requires our concentration, our effort, our time and our savvy. Is anyone else amazed at how often we still see tweets and Twitter bios touting the purchase of “quality” followers? #JustMe? Sure, it’s fairly simple to purchase thousands of visitors. But, most of us are aware that REAL connections are the most fruitful when it comes to building a voice and a message, and eventually having that voice and message shared. Real connections, like content, must be carefully cultivated not added via transaction. Guaranteed To Get Under My Skin! Promises, which can be kept, often get lumped in with guarantees. Guarantees which are generally unrealistic and often unsavory attempts to rob you of the dollars you’ve worked so hard to earn. Where’s the value in these guarantees? Thousands of fans or followers? Maybe. But do these fans and followers benefit your voice and share your message? Probably not. You’d think I’d shy away from making any promises after what I’ve just written. But I DO feel that smart promises can be kept.There’s no such thing as an absolute guarantee when it comes to social media and digital marketing, though. Do The Work! Because I Said So? I feel I can promise this…if you put time, effort and creativity into action, create a plan, and work hard to curate and create good content, make the effort to share stories, expertise and insight and dedicate time and resources to building a real voice…you’ll see results. Will you see ROI numbers in the thousands? Who knows? Instant acceptance as a social media guru? Probably not. Results? Yes. You can absolutely look at where you started and then measure how far you’ve come. Bu that takes work. Not pithy promises and snake oil guarantees. We’ve all been the cobbler’s children with no shoes. Meaning? From time to time our own presence on a social media platform isn’t as robust and engaged as we’d like it to be. Sometimes our blog sits dormant for a couple weeks. Occasionally our web site needs a little something-something to make it more vital. But we also know this is certainly NOT the best way to showcase our expertise. Nor will it help anyone to take our advice as an expert on a specific topic or ideal. Small businesses and solopreneurs know we can’t be everything to everyone 24-7-365. We have to carefully choose the types of advice we share, the areas where we showcase expertise, in order to be someone worth following and taking into account. It’s especially difficult to know who to trust in an industry like social media, which changes EVERY day – making it nearly impossible for anyone to be an actual “expert”. Consider, too, that each social platform is quite different, even with all of their social similarities. This requires understanding nuances and small differences that can also change daily, if not hourly. Do we really want the phrase, “jack of all trades, master of none” to become synonymous with expertise in the social media field? Sadly, it appears we are still heading in that direction, even with all of the social media and digital marketing knowledge we’ve gained over the years. When a marketer embraces the “I can do it all” plan for digital marketing, he or she is no longer taking into consideration the needs of their clients. Instead they are “tooting their own horn” at the expense of the very individuals looking to them for guidance. Using Twitter as publishing tool for Facebook, Instagram, etc. I see some combination of these every day. From big names in the industry. It not only saddens me, it also casts a poor light on my industry overall, which could certainly affect my ability to highlight the benefits of social media to my own circle of prospects and potential clients. If You Don’t Believe The Hype … Don’t Jump On The Bandwagon! I see absolutely no reason to join Snapchat. I’m not scared to share this opinion. I’m sure some of my peers are shaking their heads. That being said, I don’t fill my feeds with anti-Snapchat rhetoric in a bid to be heard. Nor, without an actual presence on the platform, would I tarnish my integrity by talking myself up as a Snapchat expert simply to increase my standing as a social media expert. I’ll walk what I talk without tilting my sword at any windmills. I personally love Pinterest and think it has a variety of applications that aren’t currently being utilized by the overall social media business community. But, I only have a couple clients using Pinterest and would not feel even remotely comfortable touting myself as a Pinterest expert. An enthusiast? Sure. Willing to dive in and see what it could do for a client? Absolutely. Ready to host a webinar or write an eBook? No way. I’ll leave that to actual experts, those who invest the time and energy into knowing every nook and cranny of that platform, who can back it up with measurements and robust use of the platform. Beware The “Expert,” Because I Said So! Do check that those from whom you seek expertise and inspiration, at least for the most part, practice what they preach. Above all, know that expertise in a rapidly changing industry is difficult to maintain. Proceed with caution. Choose someone that can explain a course of action that makes sense to you, while they back it up with their own experiences and actual practice. Collaboration: It Takes Two (At Least) To Tango Design Discussion Keeps Projects On Track!